Stress is squeezed away with these custom imprinted stress relievers. 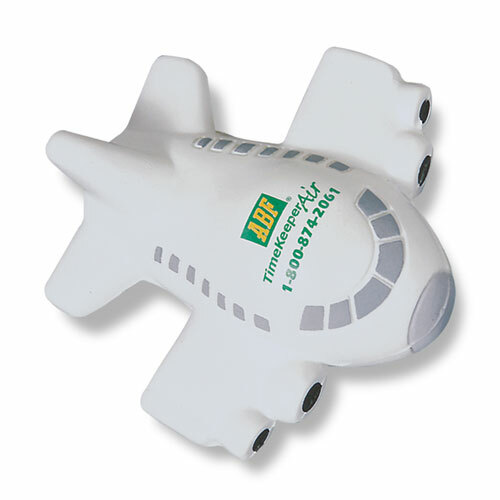 Airplane Stress Ball fly away from daily stress.A great giveaway for travel agencies, airliners and much more, this airplane stress reliever will add a decorative, stress-free accent to your desk in the office or at home. Use this off-white stress reliever to reinforce your brand at tradeshows, seminars, office events, conventions and promotional events to connect with your customers. This gift will have your brand flying high! Bulk / 18 lbs lbs / 200 pcs pcs. / 14.00" x 18.00" x 14.00" box.